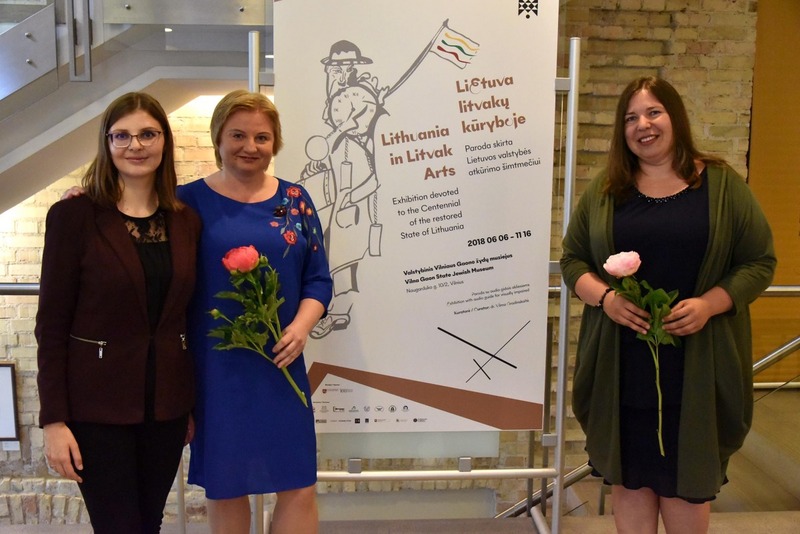 On June 6, exhibition "Lithuania in Litvak Arts", dedicated to the Centennial of the restored State of Lithuania, was opened in the Museum’s Tolerance Center. Large audience which attended the opening event was greeted by the Museum Director Markas Zingeris, senior advisor at the Ministry of Culture Rūta Pileckaitė, artist Raimondas Savickas and curator of the exhibition Dr. Vilma Gradinskaitė. “I am truly glad to present the exhibition “Lithuania in Litvak Arts” to Lithuania and to the world. It is long due to color Lithuania’s image with this cultural aspect. And it interests not only us: we have just opened an exhibition of Litvak history in photos in Sao Paulo and later this month we will open the exhibition “Lithuania in Litvak Arts” in a Chinese "shtetl" of Chongquing, which is situated southeast from Beijing and has around 30 000 000 residents”, Mr Zingeris spoke about the spreading of Litvak culture. Ms Rūta Pileckaitė, representative of the Ministry of Culture, exhibition’s main donor, emphasized the importance of Jewish culture and its input into Lithuanian and world culture. “I could hardly imagine a commemoration of Lithuanian Centennial without the part of Jewish culture”, she said. Artist Raimondas Savickas, who is one of the painters presented in the exhibition, read his own poetry to the audience. “The cobbles are orange / And plenty of music / Will spill over strings / In Jewish colors/ High in the blue sky / The past will wake up / And resound with the Lithuanian / Flourish of Jerusalem…”, says the poem. Curator of the exhibition Dr. Vilma Gradinskaitė claimed that she had been interested in the topic of Lithuania in Litvak Arts for long time, and the Centennial of the restored State of Lithuania provided her with an opportunity to introduce this topic to the broader society. According to her, the exhibition presents a variety of themes: romanticized historical Vilnius, traditional shtetls, Lithuanian sceneries, and shows how they changed due to various events such as war, Holocaust, and migration. The attendees of the opening event had the pleasure to listen to the performances of Simas Minkevičius, Austėja Pėželytė and Adelė Mariniuk as well as Museum Director and writer Markas Zingeris, who recited the poem “Song about a Rooster” which he created back in 1984. Composer Lev Schneider from New York created music for this poem and turned into a song, which was performed by Ms Pėželytė and Mr Minkevičius. The exhibition “Lithuania in Litvak Arts” will be open until November 16, 2018. You may visit it on Naugarduko St. 10/2, Vilnius. The exhibition is supplemented by a catalog and an audio guide created especially for the visually impaired.